The Toda style was founded by Toda Seigen in the Muromachi period, ca. 1560. 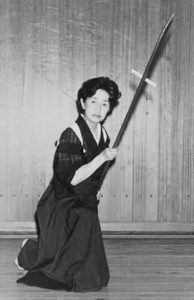 The Todas were known to be strong swordsmen who practiced one of the earliest known styles, the Chujo ryu. The name Toda-ha Buko ryu traces back to the thirteenth Headmaster, Suneya Ryosuke Takeyuki, who was also a teacher of Kogen Itto ryu kenjutsu. The present day curriculum of the Toda-ha Buko ryu concentrates on the use of the naginata (glaive). At first the student learns to use the su naginata (the plain naginata), and at a later stage the kagitsuki naginata (a naginata with a cross piece). The cross-piece may be used to deflect, trap, or jam the opponent’s weapon. The first two levels of the hon mokuroku teach the student how to use the plain naginata against another naginata, the sword, the spear, and the chain and sickle. The third and final level teaches the use of the kagitsuki naginata against the sword and the spear. The betsuden covers the use of the nagamaki, the kusarigama, and the staff against the sword. The emphasis is on learning how to win against the sword.The techniques in the betsuden have been reconstructed by senior students of the ryu, See Liam Keeley’s article on “The Re-Creation of Traditional Fighting Arts” in Hop-lite (No. 11, Spring 2001), along with Ellis Amdur’s article in Keiko Shokon: Classical Warrior Traditions of Japan, volume 3 (Diane Skoss ed.) and his book, Old School, for more information.